Cookies + Cream Mellows. Photo: Marcia Gagliardi. © mymilligram. Styling: Christian Jusinski/Surfacehaus. Props: Jay Jeffers/The Store. Okay, full disclosure here: I don’t like marshmallows. They’re usually too processed, too sweet, and too synthetic for me to enjoy them. I’ll have to be on a camping trip or around a fire pit to consider eating one in a S’more, and unless it's a handmade marshmallow from someone who knows what the hell they’re doing, that’s about it. No Jet-Puffed. Sorry, no Peeps either (except as decoration or adornment). Their flavors make them a food-lover’s marshmallow, from the afore-mentioned brown butter-sage (my favorite, with brown butter and topped with turbinado sugar) to strawberry shortcake (love the shortbread crumbs on top with a hint of salt!). There’s also orange dreamsicle (with little pieces of meringue! ), cookies and cream (with chocolate cookie crumble), birthday cake (complete with colorful sprinkles, and it’s also the sweetest of the bunch, just like a slice of vanilla cake with frosting), peanut butter pretzel (with a nice hint of salt), chocolate malt (crunch crunch), and more. The fluffy marshmallows come with fun crumbles and sprinkles on top, so it’s almost like eating a little slice of springy cake. Each one has their own personality and distinct flavor profile. There are also some savory flavors, like black sesame (coming back soon!) and elegant ones like raspberry rose lychee. No shortage of creativity over at Mellows HQ. And Steph is also a pro with culinary training, so these aren’t your hippie friend’s experimental dessert—they're thoughtfully conceived and crafted (take a look at the Mellows website to see how she makes them!). 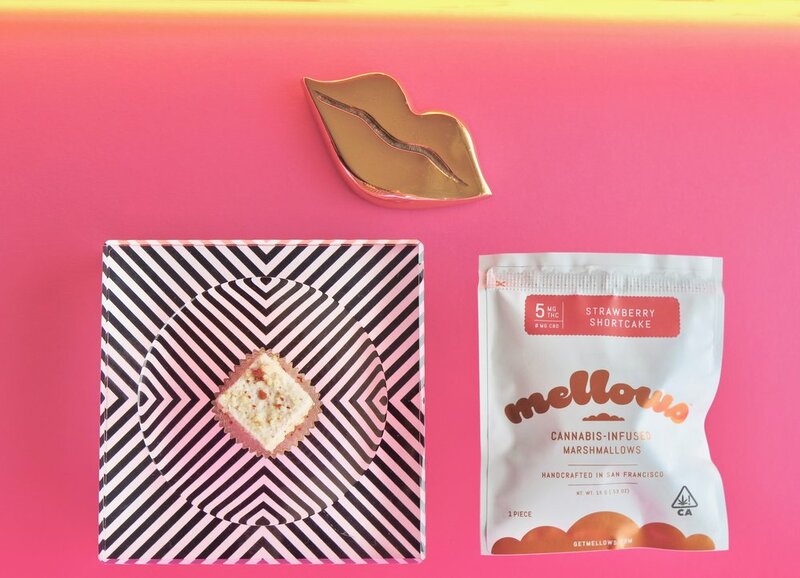 Each Mellow is infused with ~4mg–5mg of cannabis (depends on the batch, just look at the individual package). Steph uses coconut oil infused with solventless hash, which you won’t taste in the Mellows, but it does contribute to their pleasant texture. She uses 100 percent, premium, single-origin Red Congolese sativa from a master grower who is dedicated to the art and science of cannabis cultivation. Their name may be Mellows, but they are definitely uplifting and euphoric. Buzz buzz. Strawberry Shortcake Mellows. Photo: Marcia Gagliardi. © mymilligram. Styling: Christian Jusinski/Surfacehaus. Props: Jay Jeffers/The Store. If you're new to edibles, I recommend starting with just a quarter or half (~2.5mg), and see where it takes you. Onset can take 45 minutes, or it may take 90 minutes, or 120, everyone is different (it also depends upon how much food you have in your stomach already, and how fast or slow your metabolism is). Just go slow and see how your body responds. You can always eat the other half later, they keep well! I’m a big fan of enjoying Mellows at concerts (let me tell you, a night at The Greek watching Tame Impala on these was a special thing). Nibble half a Mellow an hour or so before the show, and then re-up and finish the other half later. (Or not.) Some folks may find a whole Mellow’s ~4–5mg dose juuuust right. They give me a lifted buzz, happy feelings, and I like them for shows because I tend to notice more details on them. (There’s a reason they’re in the mymilligram SF "summer" festival party pack!) They’re also fun to take a nibble of in the afternoon when I’d like a little lift (which I usually forget about until 90 minutes later and then I’m like, “Oh, high, I forgot you were coming to town!” and then I’m like this). While they’re dangerously delicious to eat on their own (seriously, don’t start snacking on them! ), you can also put them on hot chocolate (I can’t wait for their holiday peppermint bark flavor to return for this very reason! ), and I just saw friend Monica Lo at @sousweed float a black sesame Mellow on matcha, brilliant! Mellows are a fun gift, especially the birthday cake. They used to come in little boxes, and there was an assorted 12-piece box as well, but July 1 regulations have changed all that (although I hear the 12-piece gift box will be returning later!). The newly compliant Mellows now come individually sealed in their own airtight pouch—so while they may be a little smushed, they keep much longer now, and are easy to slip in your purse or bag for consumption later. They’re perfect for camping trips and hiking and picnics. And going to the movies (just be sure to time it right!). The airtight bag also makes them a little less dicey for travel, but that is a risk only you can assess for yourself! You’ll find four of the flavors on Sava (brown butter-sage, strawberry shortcake, cookies + cream, and birthday cake), with black sesame returning later this year. I feel fortunate that we can enjoy such a handmade, quality, and small-batch edible that has survived the recent regulatory gauntlet. Mmmmmmmellows. Another thing to get exited about: Steph and Coreen Carroll of The Cannaisseur Series have collaborated on a cookbook, Edibles: Small Bites for the Modern Cannabis Kitchen, which is coming out in November! You can pre-order it now and get fired up to learn all kinds of canna cooking techniques and 30 recipes! Visit getmellows.com for more info and the mymilligram page on getsava.com to buy Mellows!